When I saw this turquoise Trina Turk towel on line, I had to have it! I loved the geometric design and the color was so fresh. I pretended not to notice the total price when I hit the “place order” button (I bought an orange one too). My OCD was kicking in and those designer towels would soon be mine. I figured for the price, I would get a lush, over-sized bath mat that would compare to no other. When the package came, I noticed it was a bit small. And when I opened it, I was completely disappointed. They were cute, but nothing special, just a plain old towel with a designer’s name on it. FAIL! 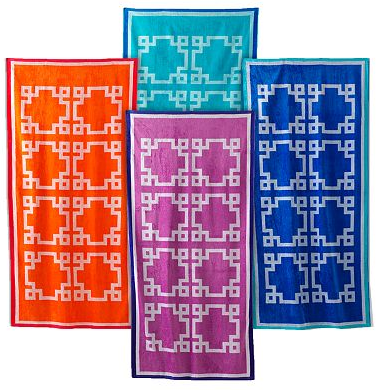 Then I found these other geometric printed towels on line at Khols. So, to make myself feel better, I bought every color, plus a Chevron striped one all for under the price I paid for 2 Trina Turk towels. I stayed calm and kept shopping!